September, Masai Mara, Kenya. 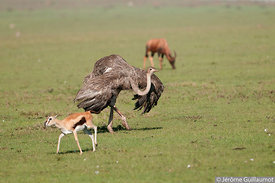 Here we are again in the Musiara area during a stay at Melting Pot Camp with Simon Chebon for a very unusual spotting, and a first time for me : the Ostrich courtship. 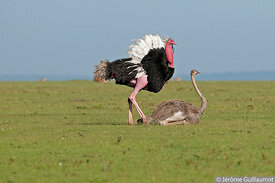 Since we observed some specific behavior from several Ostriches we came to realize that, with no doubt, that was mating season for them. 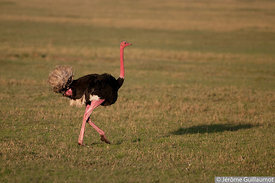 Dominant males were proudly displaying with their pink neck puffed out, head and tail up adopting the “Upright Display” posture (Photo #1). We watched their long races in the Savannah. The dominant male was able to spot a competitor from very far and, sometimes, began to run long before we managed to locate its opponent. Sometimes, he was chasing a female. On several occasions, when the male was getting close to the female, she adopted a consenting submissive posture with the head held low, neck kinked in a U-shape and the wings and tail pointing downwards (Photo #2). After watching those long races and displays repeatedly for a rather long time, we were lucky enough to attend a male courtship dance. Coming close to a female that was in the submissive posture, the male suddenly flopped down and started his love dance (Photo #3). Wings spread, he alternatively swung right then left. Meanwhile his head swayed from side to side rhythmically. His vivid pink puffed neck looked like a goiter. During this dramatic display he was lowly grunting all the time. Incredible scene ! But the female kept her distance and we still had to watch those long race for long before spotting more. 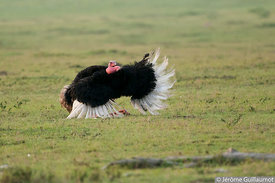 But, after a new courtship dance, the male came close to the female and, this time, she didn’t flee away. 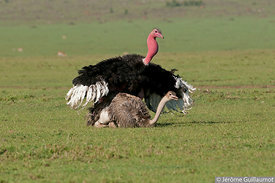 Instead, she flopped down on the round, giving the male the opportunity to catch and mount her (Photo #4 et #5). 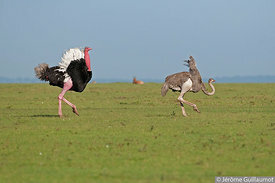 A new dance occurred during mating (Photo #6 à #9). 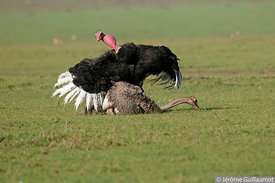 The male choreography was almost the same as during the courtship approach but, this time, with the female beneath him. Added to the rocking wing and head movement, the male primaries feathers were frenetically vibrating. 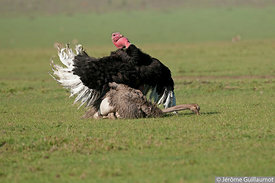 Meanwhile, the female was strangely pecking at the ground as if she was in search of food. We could perceive a clap like sound when she was repeatedly shutting the bill. The mating has been lasting 45 seconds, then the pair splitted away. Here we are ! We had invested time and patience to follow this incredible birds, instead of generally more appreciated African savannah species, and we were greatly rewarded. FineArt prints of this encounter can be ordered (click on the photo you want).